NO minimum order! We send our cards individually and with no shipping charges! 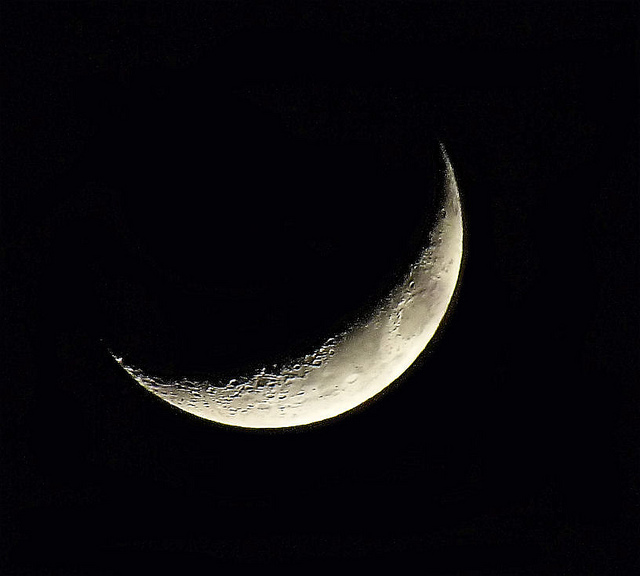 The moon is a tiny sliver when your Crescent Moon Phase begins. You can see it if you look in the evening sky just as the sun is setting. It is beautiful, wondrous, and new once again! Take some time to go out in the early evening just as the sun is setting and feel the lovely and exciting new energy of this phase. Our ancestors used to celebrate the moon’s first appearance in the twilight sky after her passage through the dark each month. After all those nights of darkness, the new light of the Crescent Moon Phase brought them HOPE. During your Crescent Moon Phase you are no longer a seed sitting in the earth. You are being pushed out of your seed; you are SPROUTING. No longer in the safety of your seed pod, you must try to develop new skills that will help you survive in the world, in this new cycle that you began about 3 ½ years ago at New Moon. Your Soul's Crescent Moon Phase is trying to help you eliminate old outworn elements of your past. 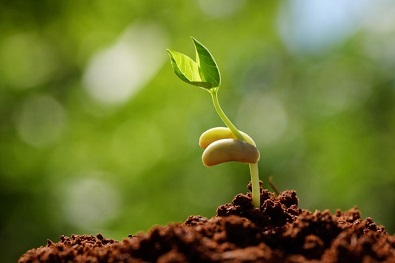 Like a seed that is pushing away its seed pod, you are trying to push away from your past and begin the creation of something new in your life. 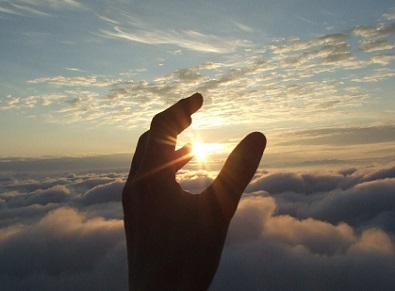 You are reaching for the Sun, the light of your new life. This may not be as easy as it sounds or nearly as fun especially when you are trying to break apart the dried up old earth that you have been resting under. You must do this before you can rise up and show yourself to the light of day. You are barely sprouting and the ghosts of your past and the old habit patterns that no longer seem to work for you are still with you. You must struggle against these inertias and dependencies from past conditions. Try not to expect too much of yourself as you venture out into the world looking for a new place to belong. Making real tried and true commitments doesn’t come until your 1st quarter phase so, you have plenty of time during this part of the cycle to experiment with new things. Remember you are on a new journey at this part of the wheel and your Soul needs new kinds of experiences from which to live and grow. This Sprout or seedling stage begins the movement of descent and a time of discovery. This will naturally arise out of your dissatisfaction with life. Your dissatisfaction is not a sign of something wrong with you. Rather it is your special growing intelligence. Your new life is attempting to grow itself out of the weight of the past. Prepare yourself by knowing that something new and unexpected is about to occur. You begin to feel a BIG energy as you push away that old seed pod. Your doings come from a place of innocence; we lack the experience of how our new behavior affects others. After all, they are used to the OLD you, not this new being you are just beginning to become. You may feel a struggle to survive as you keep your instincts alive, healthy and protected. You may have guessed by now that TOTO REPRESENTS OUR INSTINTUAL NATURE! It is your natural tendency to grow and it is your birthright! Sometime during this phase you must assert that right so that you might follow your passions and mature to your fullness. But it can be confusing at times to know which way is which. Am I growing up or am I simply regressing here? Remember that this phase will take 3 ½ years to unfold itself from the time of its inception. At times you may feel your very life, your livelihood, your health and self expression are at stake. Your survival may seem to depend upon you mustering up what little courage, heart and wits you can in order to move away from the past and the habits you may have formed then. Some of those patterns just keep us held down and in fear of moving forward. Habits that may have kept us healthy or even functioning in our previous cycle may no longer be relevant to the new life we must create for our self now. As you travel on your journey remember that on this side of the wheel from New Moon to Full Moon you are in a growing, waxing moon phase and you require a life with a new material manifestation. For it is “matter” that really matters to the Soul. The new form you are creating in the outer world gives your soul what it needs in experience in order to grow. The soul places great value on experience. Embody your VISON IN MATTER. What you desire to create in your Crescent Phase will be perfected later on. "Now it is enough to make some small new beginnings." Frustrations can occur during this time. It might seem that you recognize more of what you are moving away from than what it is you are moving towards. What people seem to be holding you back? Is it actually the people, (place or thing), or is it your reaction to him, her, them, or it? You are still in Chapter 1 at Crescent Phase. 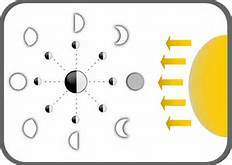 I thought this picture might help you to understand the Moon's Phases. I am fond of using the story of Dorothy and the Wizard of Oz to describe this Great Moon Cycle, because Dorothy’s story contains within it the entire soul’s journey. Crescent Moon Phase of your moon corresponds to the “trying to leave home” that Dorothy does at the beginning of her story.
" 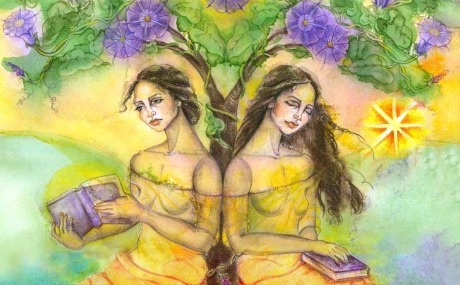 BOTH INNER WITCHES AND OUTER WITCHES OF YOUR WORLD are represented by the troubles you encounter." 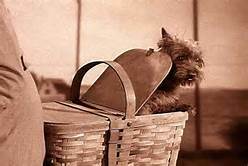 When Dorothy’s dog, Toto, messes up Miss. 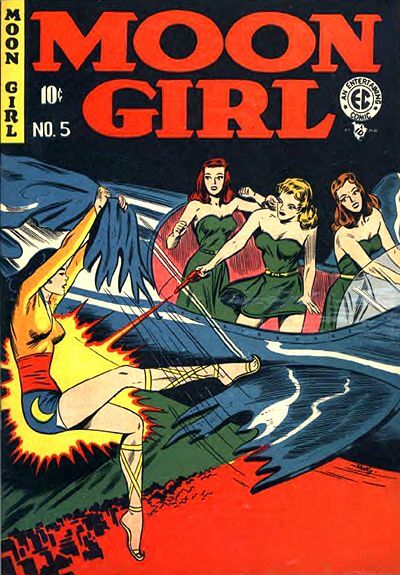 Alvira Gulche's garden, and bites that old biddy, Dorothy must bravely rescue Toto from the threat of annihilation. There are many wicked witches of the world who try to hold us back from our true soul calling. 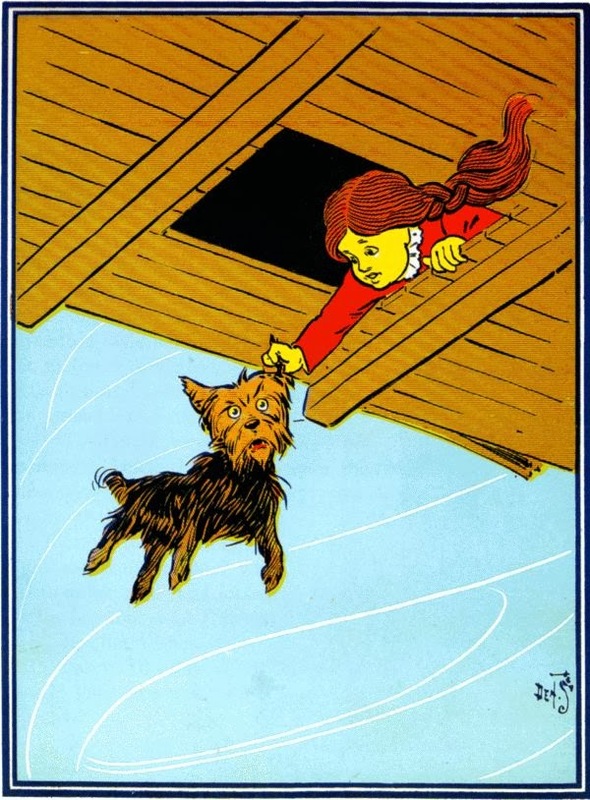 Toto represents Dorothy’s natural instincts which she must honor in order to move ahead. This picture was illustrated by W.W. Denslow for L. Frank Baum's original OZ story written in 1900. 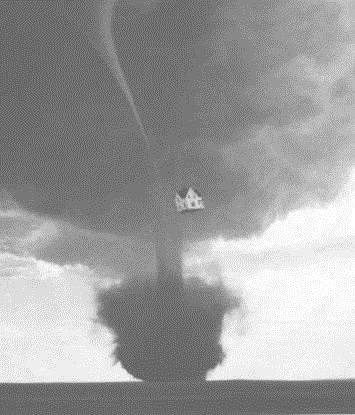 You, like Dorothy, will need to leave Kansas and journey to Oz, but what form will that leave taking have for you? In this phase, you will get clues; a storm will begin to kick up! 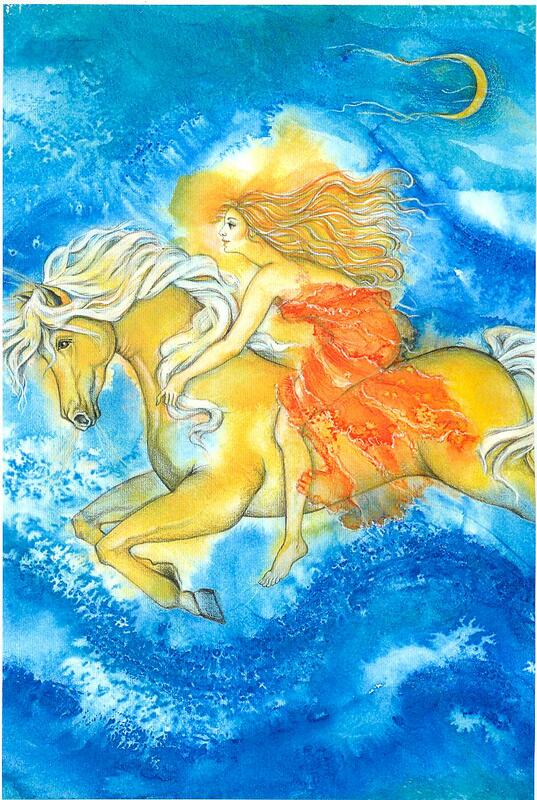 And though this is a time of more action than New Moon, there is often not much confidence. Try to be gentle with yourself, gentle as you would with a seedling, a new sprout. Notice how tender and vulnerable it feels to be a sprout. Sprouts need water, not too much sunshine, just enough so they can see the light and know in which direction to grow. You may wish to write down your dreams in your journal to discover what your soul is asking of you. Buddy up with a friend and discuss these with him or her. 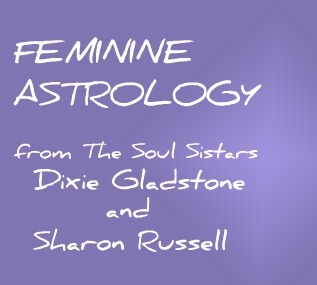 He or she might even be someone who knows their Moon Phase,.... say they are just ahead of you in the First Quarter phase......they will be able to RELATE to what you are going through by remembering what they went through at that time in their 29 Year Moon Cycle. Nurture your new self as a precious new being who is inexperienced and just beginning to grow. You are in the MAIDEN part of your journey at Crescent Moon time. You will need your dreams. You need to recognize your new opportunities. Pressures from the outer world cause you to move out of your past. New goals and ideas will meet outer world realities. A state of tension appears as you meet resistance from the outer world. 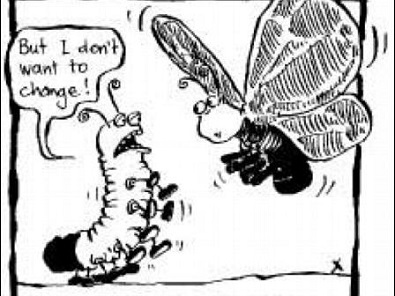 This pushes you to change, which gives you more energy. Your curiosity grows. You will try new things. You are experimenting, trying to learn to crawl, walk, feed yourself, and learn about your new environment. 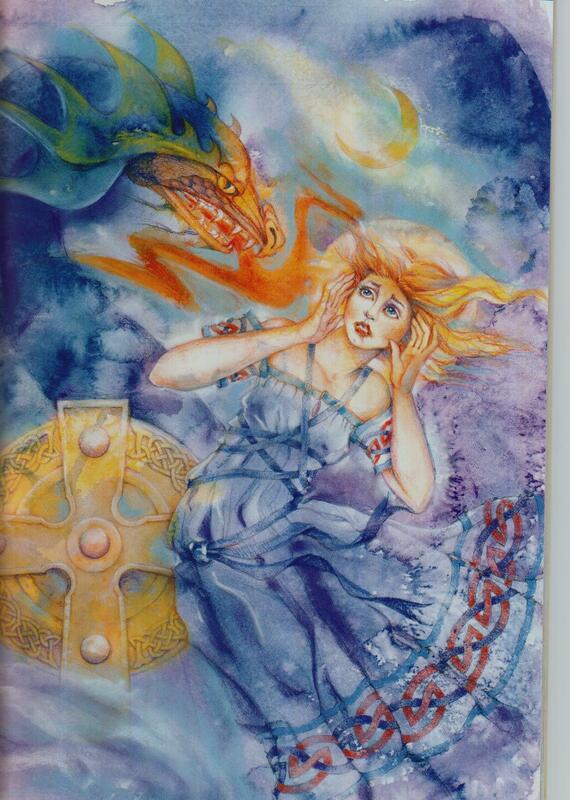 You begin to use your instincts to turn away from harmful or dangerous negative influences. You are developing a new ego. We need an Ego because it is the ego’s job to be in service to our new soul purpose. Our new ego will help us to thrive. You are growing beautiful, more beautiful every day, just as the moon does as it holds more and more light. Go out again and visit the moon to see just how stunning it is becoming at Crescent phase. You too are following your light. You too are stunning! This is your divine Soul filling up with Spirit and Heart. You are living the feminine mystery. The mystery is in you and you are reflecting it. You are becoming it. Cherish this sweet, innocent time of Crescent Moon Phase and love yourself well. With the help of your earthly ego and the growing enthusiasm you will feel as this cycle progresses, you begin to have more courage to grow into your true spiritual soul self. It’s magic how they all work together: the ego, the spirit and the soul. You are growing your own special light which wants to show itself to the world. 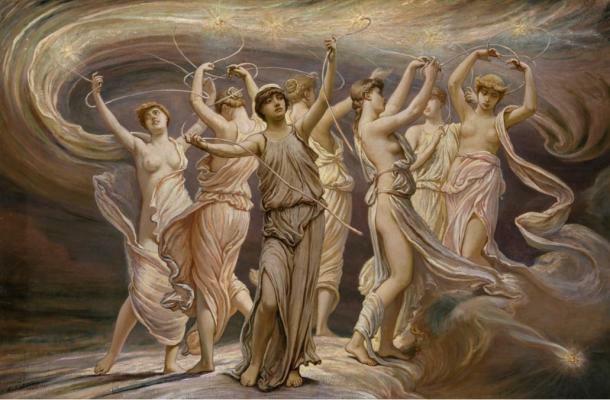 A time will come when your aspirations become “whirlwinds” around which a series of new events, events that may move quickly, pushing you to actualize and become more focused on your new life direction. 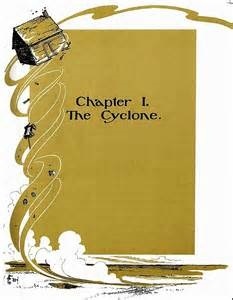 In Dorothy’s story, suddenly Uncle Henry stood up and announced “A cyclone is coming!” It hadn’t arrived YET, but it was on its way, and there would be much hurrying and scurrying around to prepare for its expected arrival. Your seed is sprouting; your sap is RISING! A storm is arriving as the new you begins to be felt! Wanting to know what PHASE YOU ARE IN RIGHT NOW? send your 1.name, 2.birth date, 3.birth time, 4.birth place to MOI: dixiegladstone@yahoo.com...it's free from me! COMING NEXT: FIRST QUARTER MOON......not in Kansas anymore!